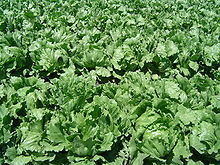 ^ a b c d "Lactuca sativa". Kew Royal Botanical Gardens. Archived from the original on 2012-11-02. Retrieved 2 April 2012. ^ a b c Ryder, J.; Waycott, Williams (1993). "New Directions in Salad Crops: New Forms, New Tools, and Old Philosophy". In Janick, J and Simon J.E. New Crops. Wiley. pp. 528–532. 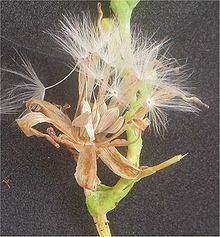 ^ Barkley, Theodore M.; Brouillet, Luc; Strother, John L. "Asteraceae tribe Cichorieae". In Flora of North America Editorial Committee. Flora of North America North of Mexico (FNA). 19, 20 and 21. New York and Oxford. Retrieved 24 September 2012 – via eFloras.org, Missouri Botanical Garden, St. Louis, MO & Harvard University Herbaria, Cambridge, MA. ^ Subbarao, Krishna V.; Koike, Steven T. (2007). "Lettuce Diseases: Ecology and Control". In Pimentel, David. Encyclopedia of Pest Management, Volume 2. CRC Press. p. 313. ISBN 1-4200-5361-2. ^ a b "Chapter IV. Outbreaks Associated with Fresh and Fresh-Cut Produce. Incidence, Growth, and Survival of Pathogens in Fresh and Fresh-Cut Produce". Analysis and Evaluation of Preventive Control Measures for the Control and Reduction/Elimination of Microbial Hazards on Fresh and Fresh-Cut Produce. US Food and Drug Administration. 12 April 2012. Archived from the original on 2012-11-09. Retrieved 19 April 2012.